My mother’s example and family recipe inspired me to create a tastier and healthier noodle dish than anything on the market today. It’s an homage both to her and the Vietnamese heritage that’s made pho the centuries-old staple in her homeland, and one that America deserves to enjoy as well. 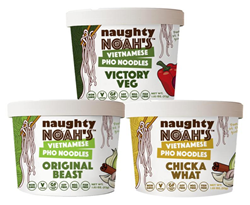 Naughty Noah’s has launched a line of instant, Vietnamese-style pho noodles, designed to provide a tastier, healthier alternative to conventional instant noodle products. The company’s gluten-free, vegan, non-GMO single-serving dishes are now available for online purchase at Naughtynoahs.com. They come in three of a planned six-flavor line. Naughty Noah’s preservative-free, all-natural ingredients include rice noodles, spices, and omega-rich coconut or avocado oil. The colorfully-packaged products come in dishwasher-safe, reusable, recyclable bowls, each complete with an individually wrapped selection of noodles, spices, and oil. Hot water is all that is needed to turn those contents into a light meal or snack that’s ready in five minutes to be enjoyed any time. The products have earned early distinction among natural foods aficionados, taking Veg Magazine’s award for Best Vegan Product of the Year at the national natural foods trade show: Natural Products Expo West. The passion and drive of company founder and CEO, Jimmy Tay Trinh, has more than a little to do with Naughty Noah’s success. Trinh’s indefatigable attitude is complemented by both his practical restaurant-industry experience and the culinary creativity he fostered as a graduate of the Culinary Institute of America. His vision for a product that stands to take a bit bite out of the more than 4 billion servings of instant noodles consumed in the U.S. each year also led to Trinh’s role as winner of the FounderMade Pitch Competition at the Consumer Discovery Show in Los Angeles this year. Founded in 2016 in Houston, Texas, Naughty Noah’s Vietnamese Pho is committed to creating the freshest-tasting and healthiest instant noodle products available. Every one of its single-serve flavors offers the exotic spices and rich tastes of traditional Vietnamese pho in a quick, convenient light snack or meal that can be enjoyed anytime. All of Naughty Noah products are vegan, non-GMO, and gluten free.